It’s no secret that hiring and retaining engineering talent is going to be only more challenging in the years to come. The world’s largest companies across all industries are now made of software and the demand for programmers outweighs the supply several times over. Engineers feel this leverage. They believe that they could go work anywhere, so finding really good new engineers is both difficult and costly. Business people that complain to me about lack of engineers are often surprised when I propose open-source as being part of the solution. In this post I’ll explain why doing open-source can be transformational for your hiring pipeline. If you’re an executive with a hiring or retention problem within engineering ranks make open-source a priority, and pivot around it. Creative people, including engineers and designers, tend to choose companies with a well articulated vision and a mission they can relate to. The best people also enjoy working on challenging problems, while helping grow a great business and being paid market range. For example, Artsy aims to make art as popular as music (vision) by bringing the world of art online (mission). We have just shipped a very technically challenging live auctions bidding platform (example of a challenging problem). The number of such auctions on the site is growing rapidly and we’re delivering tremendous value to our auction partners (a growing business), judging by the high amount of lots sold online on our site. We make money, so our paychecks don’t bounce (engineers are paid market). I see you nodding enthusiastically, but that’s most good companies! Is that enough? It’s not. Most importantly, engineers love to work with peers they respect and look up to. You need such peers. Unfortunately you cannot talk your way into becoming a reference in the world of software - you must write lots of good code, enable others to see it and talk about it. Since a large amount of programmers collaborate on Github in both public and private repositories, the contributor graph and the activity log has become a decent proxy for how much and what kind of code one produces. And short of being a resume (see my controversial post from 2011), Github is now an extremely strong signal that everyone looks at or cares about when hiring or applying for a job. 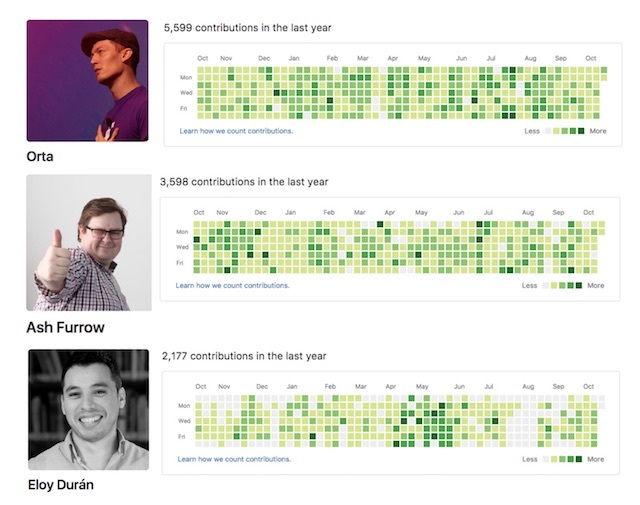 The top 3 contributor graphs of Artsy engineers speak for themselves. You’re welcome to dig into their projects and see them code in the open. Many have. You could work with these awesome people too by applying here. If your company has a vision and mission, challenging technical problems and a solid business, but is struggling with building and keeping an amazing team, open-source can help you a lot. You’re already building your software on open-source. The next step is to create a process by which your team can open parts that aren’t core competitive advantage. Encourage or take a step further and mandate it. It should be part of your engineers’ job and the best ones will run free and make a name for themselves permanently associated with your organization, enabling a sharp turn in your terrible engineering hiring pipeline. Use Open-Source to Pivot Around Your Hiring Problem was published on October 31, 2016 . See a typo?